"A sweet school-years déjà-vu: grid-paper math notebooks. 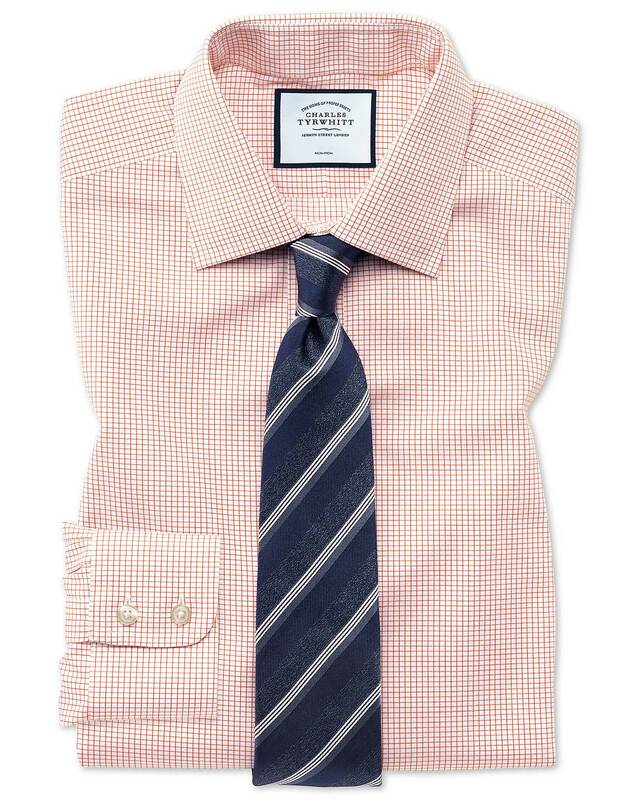 Not quite a check, but a lovely grid pattern: this shirt looks splendid with a bright tie or with two buttons undone – a handy styling ease for after-work socialising. Speaking of homework: this one requires none: it’s Non-Iron." For a custom shirt, the sleeves were short, because most of the non-iron apparently run short and no one tells you. Response from Charles Tyrwhitt: While it's certainly a shame that this shirt did not prove to be an ideal fit for you, I can assure you that our non-iron shirts are not sized any differently to the other shirts we offer. In fact when it comes to the sleeves, they usually run a touch longer if anything to allow for some shrinkage. Sadly, we don't offer a 16.5/37 so would be unable to offer this as an alternative option, but you can look to move up to a 17/37 if you feel this would be suitable. In the meantime, I will ensure your feedback is passed through to the Products Team so they can review it accordingly. First orange shirt added to my shirts in a long time. This one is a very nice shirt. Thanks. Great shirt. We NEVER spend this much on dress shirts, but because of the quality and fit, my husband now has 7 of these shirts. He loved the 1st order of 4 so much, he had to have more!